Welcome to Year Two of our Three Year Experiment! Our goal as a family is to double our net worth and become location independent within three years, or right as I turn 40. Our dream is to become less dependent on our traditional jobs, and be able to travel more or live abroad for a few years. We’re aiming to get to that point by the end of 2019, but it’s a big goal, and we’ll need to challenge ourselves to make it happen. Year One’s challenge was “A Year of Good Habits.” Each month of the year, I focused on adopting one new habit to help us achieve our goal (I wrote about the results of that experiment here). I found that yes, making your bed each day does help you get better at financial stuff. Strange, but true. When you start the day with small accomplishments, you start to believe you’re someone who gets things done. You begin to trust yourself more. And that trust carries over into how you manage your money, how you spend, and how much you save. We were able to save up cash for several costly home repairs, completely pay off our apartment in Chile, and kill our last car loan. We increased our net worth by more than 30%, getting us really close to hitting 1/3 of our goal of doubling our net worth in Year One. Year Two’s Challenge is called “A Year of Good Food.” Our family spent an average of $966 US per month on groceries in 2017 for our family of four. That’s almost $12,000 in just groceries last year. A typical week’s grocery haul. But we’ve tried for years, without lasting success, to lower this number. So this year, our main goal is going to be to stay within a budget that’s about 20% less than what we spent last year–$772US per month. That might seem like a huge number, but for us, if we were to be able to reduce our food spending by almost $200 per month, that would mean $2400 in savings at the end of the year. To incentivize ourselves, we’ll take that $200 per month in savings and transfer it to a special savings account for Chile. By the end of the year, if we keep our grocery spending below our goal, we’ll have enough for two roundtrip tickets to Santiago. This year we want to challenge ourselves to consistently hit what is, hopefully, an achievable goal. This year we’re going to give this spending area lots of attention and focus to see if we’re able to make lasting changes in our behavior. Each month, we’ll focus on one new habit related to food to help us achieve our goal. I’ll write about how we did at the end of the month, and share which habits were more helpful in controlling our food spending. January’s habit: make one, and only one, grocery shopping trip per week. 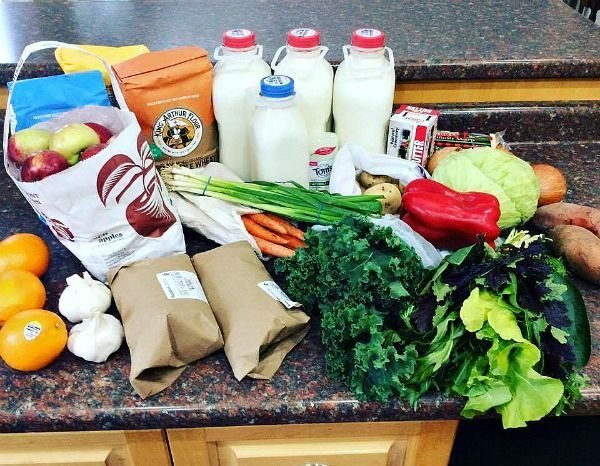 We aimed to spend no more than $150 per week on groceries, and eliminate small trips to buy “one or two” items. How’d we do at making only one trip per week? February’s habit: shop with a list. We did this in January, but we did stray from the list a bit and buy extra food, which resulted in a very full refrigerator and pantry. My hope is to buy smaller hauls over the next few weeks, eat up the food we have on hand, and eliminate our side trips to pick up “one or two things” here and there. Those trips really add up quickly. I’m changing my behavior, and one of those really ingrained behaviors seems to be, buy enough food!! My reptilian brain doesn’t want me to starve. But my rational brain knows we’re throwing food away we have so much! Click here for February’s report. Total Spent in February: $713.51. For March, we’re using cash. I went to the bank today and pulled out $360 in efectivo. I hope that will last until mid-month. I’m handing over some to Mr. ThreeYear, in case he feels the urge to pick up any groceries. Will we spend less because cash is mentally harder to part with? It remains to be seen. We have five Fridays in March (which is the day we buy groceries) so this will be a tough month. We’ll keep you posted! In April, I shopped at the same store each week. It was a busy month, and Mr. ThreeYear was on work trips for more than two weeks of it. So, we had one less person to feed. You can really see that in our total spending. We spent almost $100 less than last month. 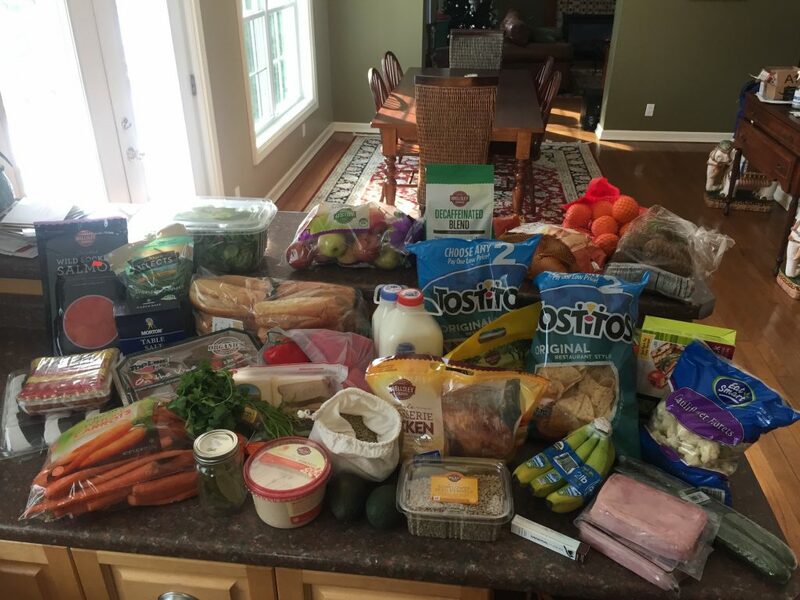 To be in the $600s is a big deal for me, because last year, we regularly spent $900+ and even $1000+ on groceries. So the downward trend is exciting. Total spent in April: $670.50. For May, we’re shopping the perimeter of the store. We’re trying to eat down some of the food in our freezers (we bought 1/4 of a pig a few months ago) and so shopping for mainly fruits and veggies will hopefully help us eat well and encourage us to dig through our freezer for grub. Despite a crazy month of selling our house and finding a new place to live, we still managed to stay relatively on budget, only going over $3.95. Here are the details for May. Total spent in May: $775.95. We are moving this month so we aren’t setting any goals for the month aside from “survive the move.” We’re going to try and eat as much of the food in our freezers and pantry as possible, and not run out for too many quick trips and fast food options during packing, but we’re also realistic that this month will probably be a spendy one. I’ll keep you posted! Total spent in June: $691.78. Our focus for July: make easy meals. The goal is to keep things as easy as possible in the kitchen since moving is hard! Unfortunately, we got majorly off course in July! How could I have anticipated the cost of filling up a new refrigerator and pantry? Plus, all four of us ate breakfast, lunch, and dinner at home. We had a month that was waaaay over budget. Time to get things back on track for August. Total spent in July: $938.99. August’s focus: shop only at Aldi. Now that we live in North Carolina, we have access to discount grocery stores like Aldi and Liedl. August was another in-budget month. We spent $733.45 even though $50 of that was in preparation for the Whole30 challenge I’m tackling in September. But it was a long month, with a lot of staying home, unpacking, and otherwise routine and monotonous days. Total spent in August: $733.45. September’s focus: Complete Whole30, the elimination diet where you eat just whole foods. I successfully completed the challenge but it was very boring. And I didn’t lose any weight. I know you’re supposed to focus on your NSV (non-scale victories) but really. Couldn’t I have lost a pound?! But honestly, I felt so good the whole month. Eating well really does help your body, without a doubt. Total spent in September: $826.59. This month, there was no focus. I just spent the month working on some of the basics that have helped me spend less all year: shopping at the same store, shopping with a list, making a meal plan, eating all the food in your house. It worked! Our expenses for October were the lowest of the year. Go us! (Of course, we were gone one week and Mr. ThreeYear was traveling another week. But anyway!). In November, we worked on cooking batches of food for the week on the weekends, to reduce the amount of food waste. It worked well until Thanksgiving came, and then we headed to the beach and our meal planning went out the door. Another month we went over the budget, sadly. How will we do in December? I have found Instacart! It’s a grocery delivery service that delivers Aldi groceries! I’m so excited. I’ve used it twice so far and have been very happy. We’re spending less because I’m not in the grocery store picking up this and that. And the craziest part? We spent less money this month. I’m going to keep using it in January to see if it continues to result in a lower overall monthly bill. All the gory particulars are included in my review of Instacart. Well, we did it!! Our overall yearly total for groceries was $8,958.60, down from $11,454 in 2017. Our 2018 monthly average was $746.55, down from $955 in 2017. While that may not seem like a lot, for us, it meant we saved $2400 in grocery spending from 2017. And I managed to squirrel $1600 of that $2400 into an account for our Chile tickets, which was my original goal (I didn’t exactly save the $200/month every single month of last year. Whoops. #Progressnotperfection). Here’s a post on what I learned from that year-long experiment. I am SO glad I did it, even though it was hard at times (a lot of times!). Thanks for joining us on this Year Two experiment! What will Year Three bring? I’ll let you know soon!